The inspiration for these nutty-dusty-tender cookies come from Russian tea cakes I used to get many years ago in cafés. There are also called Mexican wedding cookies (or cakes). My version has a faintly Middle Eastern flavor, just to throw in another regional description. Though less sweet, uncoated cookies are still yummy. Adapted from Chowhound’s Pistachio Mexican Wedding Cakes. Makes 44 cookies, give or take. additional powdered (confectioner’s) sugar for dusting, about 1 to 1 1/2 cups; eyeballing by volume here is fine. Put the pistachios and 2 ounces powdered sugar in a food processor, and pulse in 5 to 10 second increments until the nuts are finely ground, but not pasty. Sift the pastry flour, salt and spices into the processor bowl, then pulse briefly to lightly mix together the dry ingredients. Slice the butter into 4 to 6 chunks for easier mixing, and toss it along with the orange blossom water and 1 teaspoon cream (or milk) into the processor. Pulse in 10 to 15 second increments until all ingredients just start forming a ball. If the dough still seems dry and powdery, add another teaspoon or two of cream. Scrape the dough into a bowl and refrigerate until it’s stiff, at least 2 hours; overnight would be fine. Preheat to 350ºF — this is based on my using the “convection baking” setting. Line a cookie sheet with a silicone liner or parchment paper. 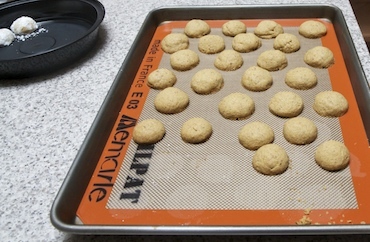 For each cookie, scoop out a tablespoon or so of dough and roll it into a 3/4 to 1 inch ball. Place the dough balls about 1/2 apart on the cookie sheet. Bake for 14 to 16 minutes. Cool for 10 minutes. There are two ways to coat the cookies, either way is fine. (1) Place 2 to 4 cookies in a bag with 1/2 cup of powdered sugar, and gently jostle them around until coated; this gives a chunkier but more thorough sugar coating. (2) Place the cookies on a cooling rack or towel, and sprinkle them with powdered sugar from a strainer; this method yields prettier looking cookies, but not as sweet as the first method. Serve with tea, coffee, or by themselves. Store leftover cookies in an air-tight container. This was written by sairuh. Posted on Wednesday, February 16, 2011, at 11:10 am. Filed under Food. Tagged cookies, recipe. Bookmark the permalink. Follow comments here with the RSS feed. Post a comment or leave a trackback.